Doing laundry is a process. Its a process not too many people actually enjoy. Adding great smelling products to your wash help the process along for me! 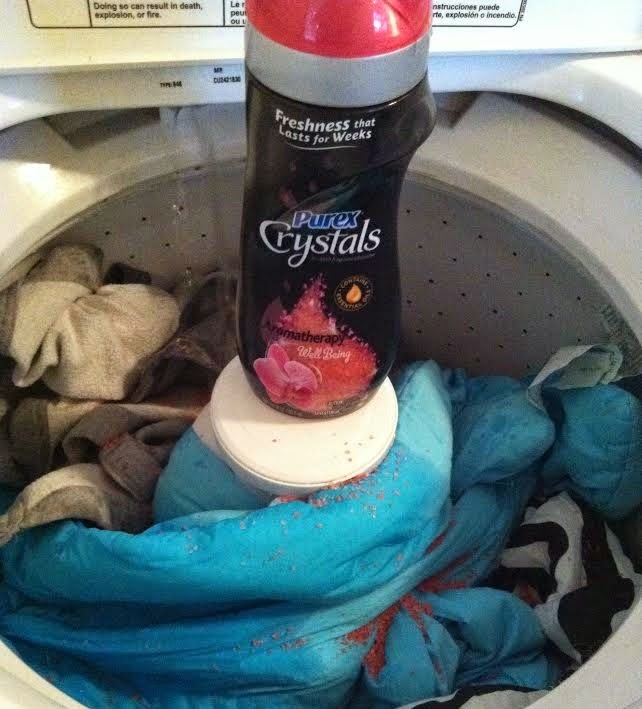 I've been using Purex Crystals for a while now and can't get passed the scents! The Aromatherapy Well Being scent is so great! It sticks to my clothes, even after a few days of being in the closet. With the Essential Oils mixed in, I'm not sure if it's all in my head or not but the scent helps me feel a little more upbeat. I didn't think this was possible as I am a decently positive person, but I really like it a lot! Want your chance at trying out a great scent like Well Being? Enter the giveaway below! Dates: Starts November 11/4 12:00 am EST. Winner will be chosen November 13, 2014 11:59 pm EST. I love lavender, but can't wait to try the new Crystal's scents! Fresh Spring Waters is the scent we love the most!!! I've been using laundry soap that the sent is called Apple mango tango. its the only thing that gets the nasty smells out of my husbands works clothes. I love the Lavender scent the best. Thank you for this chance to win. my favorite scent to add to my laundry is lavender,so calming. I love the lavender it smells the best. Love the Lavendar!! Especially when I wash towels and sheets. The well being is the scent for me! I love almost any fruity or tropical scents. I also like anything scented with orchids. Thanks! My favorite laundry scent is rain fresh or mountain scents. I like to add lavendar to my laundry. My favorite scent to add to my laundry is lavender. I've tried several different scents/ brands of the crystals, but the Gain ones are my favorite so far. I would love to try it !! Lavender is one of my favorites! Ty! I love lavender right now in my laundry. Yummy! I am looking forward to trying the serenity scent! I like the blue crystals! Yellow ones are good too but we prefer the blue! I like adding tropical scents. I love to use the Purex Fresh Spring scent booster crystals, they make the house smell so fresh!! !